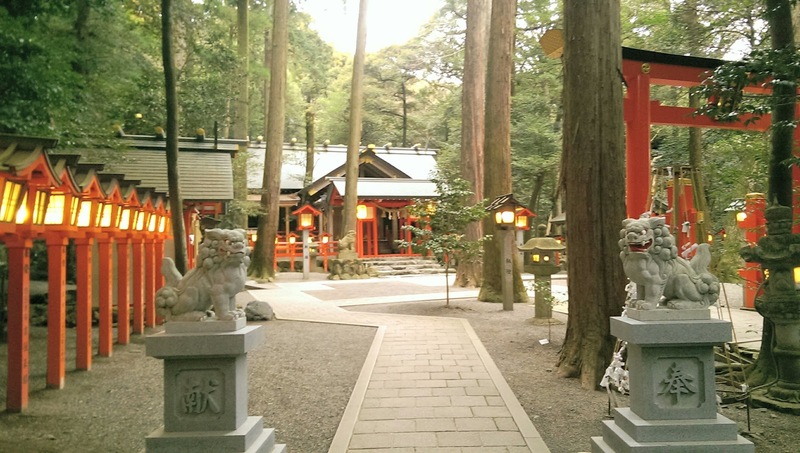 Day 5 at Tsubaki Grand Shrine (to read about why I'm here, read Entering Another World, my last post). 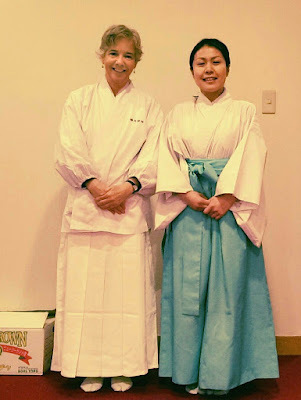 Over the last few days I have been gradually transformed from my usual black-clothed Western self into "staff" at Tsubaki - first a white cotton jacket with the kanji (Chinese characters) for Tsubaki Grand Shrine over my Western clothes, then, yesterday, multi-layered full Shinto robes, all in white, that took a sweet young woman priest, Sakaka-san, about twenty minutes to put on me (today I was on my own, and no one has laughed, so I must have been successful). I have never in my life worn all white, even at my own wedding, so it's an interesting transformation and experience. It helps that I've worn Zen robes for years (all black, of course). The only really horrible part of the costume were the zori - the traditional Japanese sandals with a thong between the toes - for whatever reason, they are instruments of torture for me. I tried walking around in them yesterday, trying not to grimace in pain with each step, and today I just wore my own shoes - black, of course - over the tabi socks and tabi sock protectors! Gaijin (foreigner) prerogative. I win points for knowing how to use chopsticks and how to sit in seiza (kneeling on one's feet and legs) and actually get up after service rather than falling down because my feet are asleep, so I figure not wearing zori is just fine. I also have white gloves for cleaning. 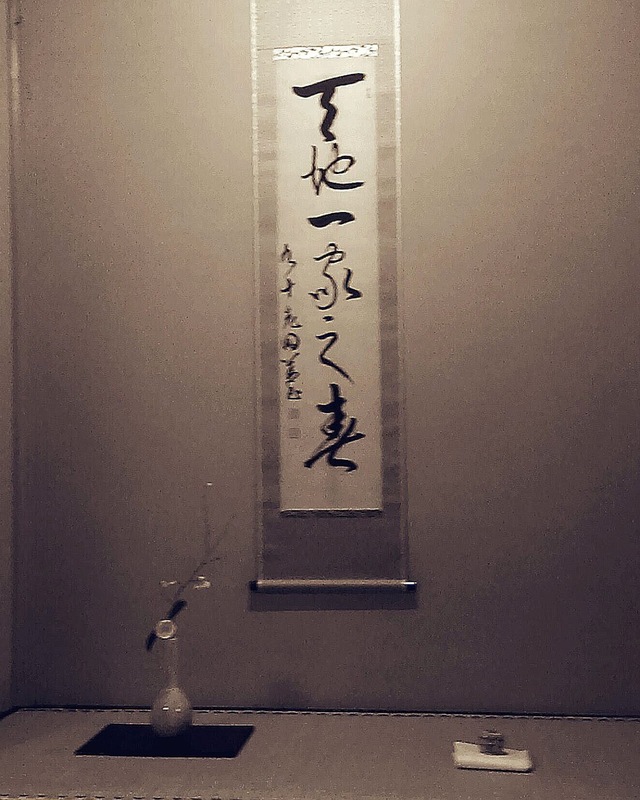 As a Zen student, I am familiar with the importance of cleaning as a spiritual practice, and my theory, after five days here, is that the Zen obsession with cleaning was something that came from Shinto, an example of religious syncretism. Ochiai-san told me, the first day, that cleaning is integral to Shinto. Every morning we clean, before the morning service. As a sort of honorary junior priest, I join the priests in sweeping outside. Imagine several acres of shrines and gardens, linked by gravel paths and stone steps, set inside an old growth forest of ancient cedar and cypress, with a multi-layered canopy, and imagine how much falls to the ground overnight - branches, leaves, pieces of bark. 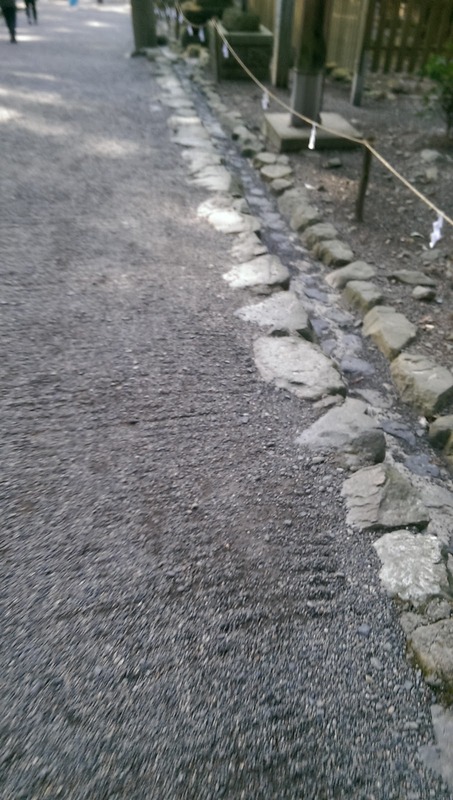 By the time the first visitors arrive, nearly every square inch of gravel and stone has been swept clean. 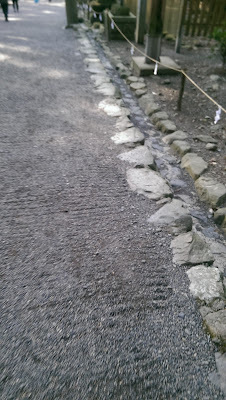 I will never walk around a temple or shrine again, blithely strolling on perfectly raked gravel, without considering that someone swept that gravel, that morning. But I love sweeping. If they let me, I think I'd do it all day. Last night was very windy, and so there was extra detritus everywhere. I was delighted, because I knew it couldn't all be swept up before service, and I begged to go back out and sweep more. There is a great simplicity and satisfaction in sweeping, after all the complexity of my usual life. 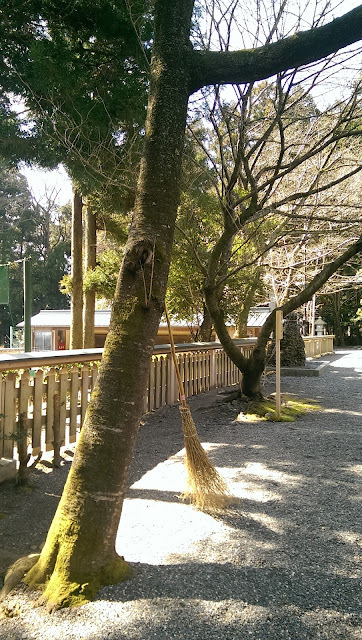 The brooms are twig brooms that effortlessly remove the light leaves, leaving the tiny pea-gravel gravel behind. I think of all the people who will visit today, and who will walk up the swept stone steps to bow at the shrines, or the subtle happiness they might feel in being in a place that feels so taken-care-of. 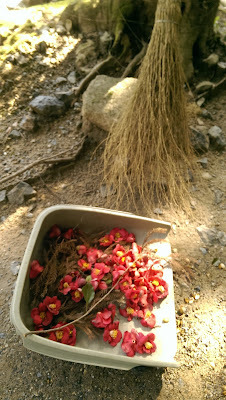 The high point of my sweeping this morning was beneath a camellia tree that overhung a small outdoor shrine. The camellias are still in bloom, and they are truly trees here - twenty, thirty feet high, or higher, forming a secondary canopy beneath the taller trees. The red flowers littered the ground, and I swept them up into a great beautiful flowery mound. Tsubaki means "camellia" - well named! I've been doing a lot of reading about Shinto, and an important concept is purification - bringing back to harmony what has gotten dis-harmonious. Cleaning is a form of purification of the environment, bringing harmony and beauty to what is around us, just as I felt that my sweeping was a gift to everyone who will walk the paths of Tsubaki today. Anyone who has tried the "tidying" in The Life-Changing Magic of Tidying Up by Marie Kondo has probably felt this, at least for the moment that your closet was organized before entropy took over again! 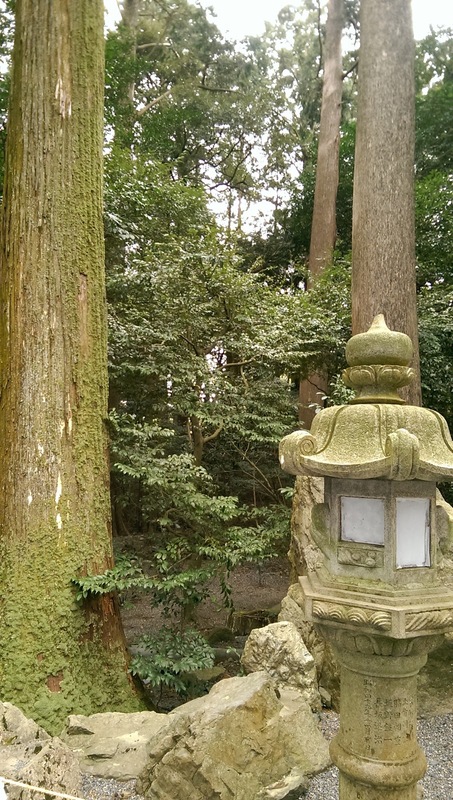 I have been really struck by the way both Tsubaki and Ise (and the great Inari Shrine I visited in Kyoto on my last visit) are inside forests of ancient trees. Ochiai-san told me that the original shrines were not inside buildings at all: they were groves or stones or mountains. The holiest place here is a patch of ground beneath the trees with three small stones, a place you could easily walk by as a tourist and think nothing of. This is the place where the grandson of Amaterasu, the "goddess" of the sun, came to earth, met by Sarutahiko-no-okami, the guardian kami who is enshrined here. In fact, behind that little patch of earth is a huge mound, in an otherwise flat area, and even though Shinto shrines generally don't have graves, this is the grave of Sarutahiko-no-okami. Approaching the entrance to Tsubaki Grand Shrine, it is easy to be distracted by the shrine building where the "car blessings" take place. 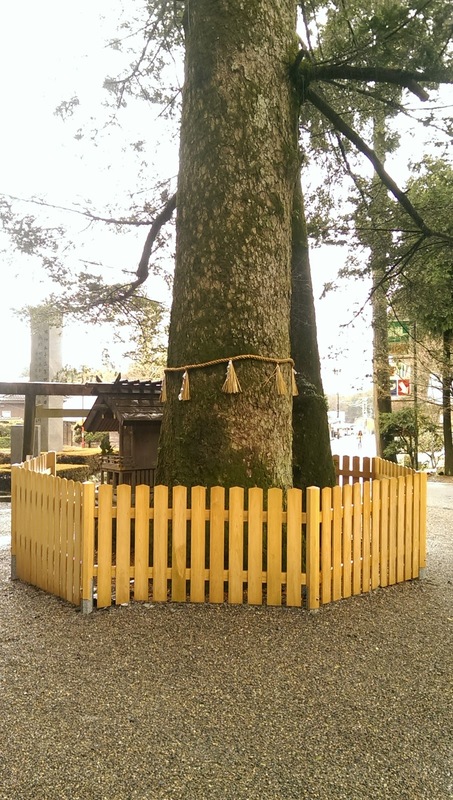 Only in the last day did I notice that there is an enormous tree in front of the building, with a shimenawa (braided rope) around it that signifies the presence of kami, and a tiny shrine at its base, and then I read that the tree is highly significant for Tsubaki. When I looked closely at it, I realized it is a huge old fir, perhaps Abies firma (momi fir), a kind of tree I haven't seen elsewhere here, where there is mostly Japanese cedar (Cryptomeria japonica) and cypress (Chamaecyparis). This tree is a shinboku, a sacred tree invested with kami. The little shrine at its base is there to honor the kami of the tree. And I had walked by it for four days! We are so trained to think that the sacred is inside a sacred building, not in a tree, no matter how massive. But when I really looked at the tree, awe is the word for what I felt, the definition of kami - "what evokes awe." When I was in Japan before, we visited a small village with two of these shinboku trees- two Japanese cedar trees that were nearly 2,000 years old, each with their heavy shimenawa. flanking the path to a shrine building. If I could guess, I would guess now that what came first were the sacred trees, and only later a shrine was built that honored the kami of those trees. Of course, almost all the trees I have mentioned are on the IUCN Red List, because Japan is a small country, and there are not many great forests left. In fact, the rebuilding of Ise and other ways that traditional culture uses the traditional woods of Japan, are an issue for the survival of the native trees. As I read in this Japan Times article about the preservation of hinoki cypress forests, the wood used at Ise: "We have to balance the protection of our environmental heritage with the protection of our cultural heritage." Where is that balance? Perhaps one day there will be shimenawa around entire forests, protecting them from our human appetites.And yet, yesterday I sat drinking green tea in the beautiful traditional tea-house on the grounds of Tsubaki, built of all traditional materials, gazing at the tokonoma, the alcove with a seasonal scroll and flower arrangement, my spirit felt held within the simple materials of the house -- wood and clay and paper. Later I watched the white-clad artisans who are renovating a part of the tea-house, keeping alive the endangered art form of Japanese carpentry. There is something sacred in this too, and careful. I can't pit tradition against the environment - I want tea-houses to continue, and the knowledge of how to build them. I want the 2,000 year history of Ise Shrine to continue, with all it sustains. 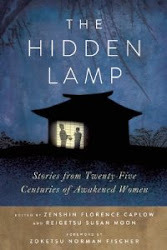 Perhaps if we treated trees and wood with the same care that the priests sweep the gravel paths of Tsubaki each morning - well, we would live in a very different world. When you headed West (to the East) I was hoping that you would have time to take a few photos and share them when you returned... I'm SO happy that you are writing and sharing your experiences and thoughts during your trip!